I got a request on how I would paint Word Bearers using the same "quick and dark" method I used on my Dark Angel and Ultramarine. It really was a question of could I use the same approach with red spray paint and black like I did with the other two models. In the end, I think I came close to producing a decent model, but missed the mark slightly. Not because the technique failed, but because my weathering was a bit too heavy handed overall and the finished look suffers because of that. I wanted a truly battered and war torn look, but I should have used a variety of techniques instead of relying on just one to carry the look. That being said, let's look at what I did to get here. I started off by priming him black and then giving him a zenith spray coat of the red spray paint I had on hand. It wasn't so much red as it was brown, but I figured it would work just the same. I should note that you could use any shade of red really, it comes down to personal taste in the end. Here's the step by step for the zenith spray painting technique. After that, I gave the model a few passes with GW Carroburg Crimson to blend everything together and give it more of a red look than brown. I considered using other colors, but opted to keep adding red to see just how much I could alter the original color. Once I had my armour done, I cut in everything with black paint to see how he would look before I added the final details. At this point, I noticed something I'd missed before and that was the wonderful change in color from the basecoat to the newly shaded areas. In some places, I'd simply forgotten add a layer of wash and because of that, they retained their original lighter shade of brownish-red. The best example is the top of the backpack. It might have been an accident here, but it's something I'm going to actually try and do next time I have a model to paint. I really like the variation and I'm going to see if it's something I can push next time around. Once I had my silver areas painted in over the black, I set about weathering him. I used a combination of powders and a pencil to really distress his armour. This is where I went a bit too far. I comes down to a combination of things for me. I should have paid attention to my highlights when was shading so I had the smooth transitions and I should have gone a little lighter on the weathering overall. I have to admit, Word Bearers are fairly straight forward to paint. Red armour and silver for everything else. There aren't many steps there. That being said, he does look war torn... just a bit muddy as well. I'm certain this technique would work for any "red" model. Simply adjust your spray paint color accordingly. Next time I'll focus on controlling my shading and then watching how I apply my weathering across the model. After looking at the Word Bearers iconography, I can tell you I would be seriously tempted to go either the sculpted shoulderpad or decal route. Freehanding this thing is going to be very time consuming. It's not impossible, it's just going to eat up a good bit of time. You're going to need a really nice brush and a steady hand in order to be able to get the fine detail. That being said, here's how I would break it down into manageable shapes in order to paint it. This might help those folks looking to add the image to a banner or the side of a vehicle where you only need to paint one or two of them. I'll add that it's well worth thinning your paints slightly so that you don't leave any surface texture when you paint. It might take an additional layer or two, but the smooth finish is worth it. First thing is to get your yellow flames down. There's no magic to the shape or size, it's just what works in the area you have. I kept mine kind of square as it mimics the shape of the skull inside it. Second we block out the overall shape of the skull with a rectangle. 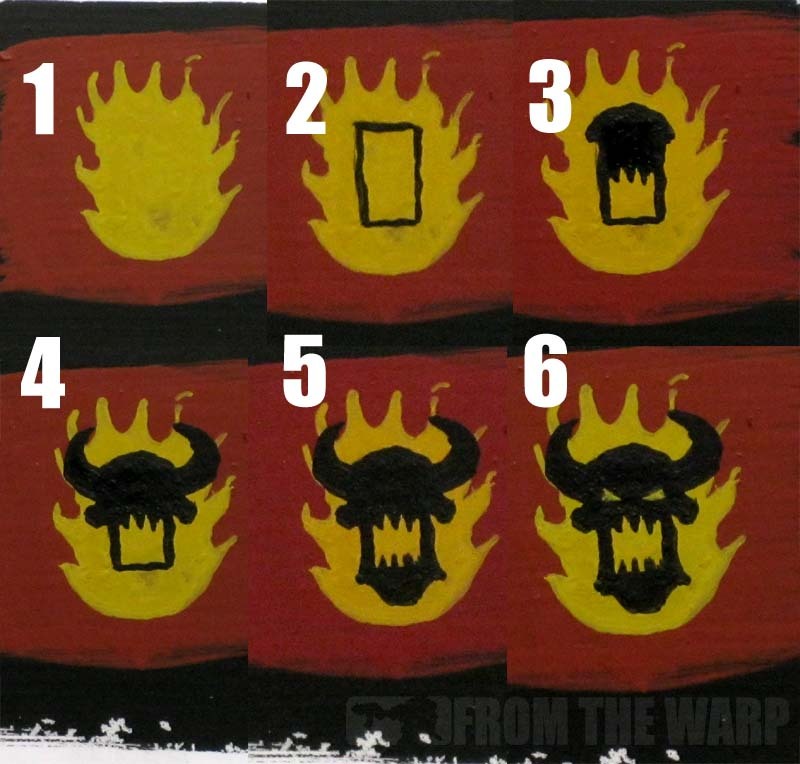 The overall rectangle should be slightly smaller than the flames and what you want your final skull to be. As we flesh out the image, we will be adding to the outside of the rectangle and want to make sure we still have some yellow surrounding it when done. Third we add the top part of the skull and upper jaw. Just make the top edge of the rectangle rounded and add a few teeth on the upper inside edge of the rectangle. Fourth we add the horns and sides of the upper jaw. The horns are the harder part to add since you need to keep them symmetrical. The sides of the upper jaw are nothing more than small protrusions on each side of the rectangle even with the upper teeth. Fifth we finish out the lower jaw. This includes some teeth along the bottom and filling out the lower jaw by extending it down slightly and adding similar protrusions on the sides like we just did for the upper jaw. Sixth is the eyes. Since there was no need to try and add them in the beginning and having to work around them the whole time, we can add them now quite easily. Going back in with your yellow, you can lay in the basic shape for each eye. You don't have to be perfect since you can use your black to correct the shape as needed until you have exactly what you like. And there you have it, a perfect Word Bearer icon broken down into a rectangle and built back up. I think it looks pretty good Ron. Especially for a quick job. He does look a bit too monochrome, but that's not too much of a worry in my books. Great blog, by the way, really enjoying it! Gah, you make it look so easy! I love the look of this, so much I want to give it a go even though I never had an interest beforehand. 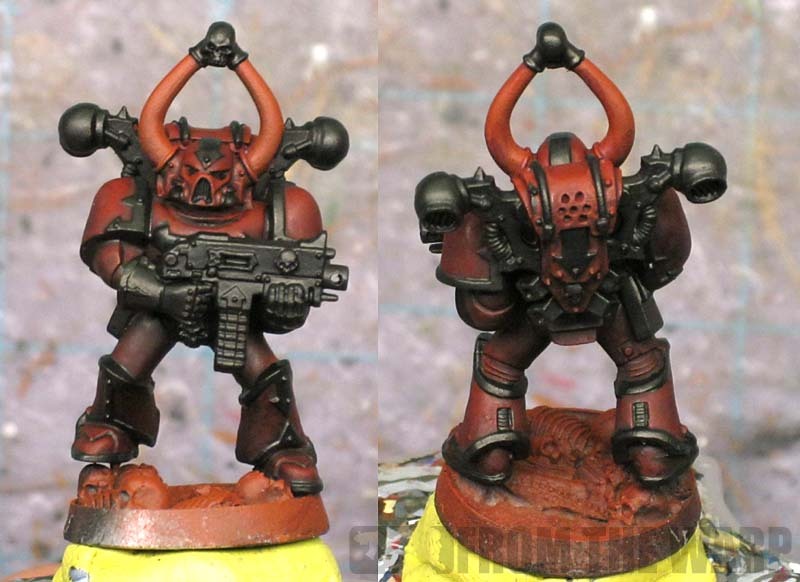 Did you consider using GW's red glaze to boost the red tones after the brown spray, rather than blending with the read paint? GrimKlaw: monochrome is a good word for it. I think if I were to do an army, I'd want to introduce a spot color like gold or add the iconography to his shoulder (which I left off) and that might help break things up a little. MIK: It is easy to do since the majority of the work (blending and coloring) is done with the spray paint. Piotr Michalek: Good question. This guy alone took about 30 minutes not including dry time or assembly. So if you had your squad assembled, you could paint them up in an afternoon quite easily without a doubt. Keep in mind he's really only black, red and silver too so that makes it fairly quick. pingo: I did not. Excellent question though. That might have made a huge difference in the final look. This is the story of how you put an army on the table quickly and have it not look like @$$. I do much the same thing. Techniques like these really help out people who enjoy the playing aspect a lot more than they do the painting and/or modeling side of the hobby. Proper WordBearers need flames and all kinds of crazy script on their armor. Also they have the flaming skull chapter badge, which comes in a decal and a sculpted shoulder pad. Without flames, scripts, and the chapter badge, it just looks like a dark red CSM. Would you do Ultramarines without the U? Myles: Yes. Usnig the right kinds of trickes can definitely speed up the time it takes to get an army on the table. The trick is knowing which one to use. Muskie: I know, I left the iconography off this guy. I did not know about the script on their armour though, that's interesting. 30 min?! Damn. I don't think you should feel too bad about the weathering with those results in 30 min. Nice work once again. Thanks, but the weathering kinda killed the model. I wish I'd stopped sooner. I know I'm heavy handed when it comes to that and I lost track of it. Very nice work Ron once again, I think I would have gone for a more scab red colour but that's just personal preference. Major kudos to you, I would never have thought to use a brown whilst setting out to achieve a dark red model..........you really know your colours dude. That's a great color for red. I primed my Blood Angels with that very same color. It results in a VERY rich red right from the outset. I did find it dries a fair bit slower than white or black though. 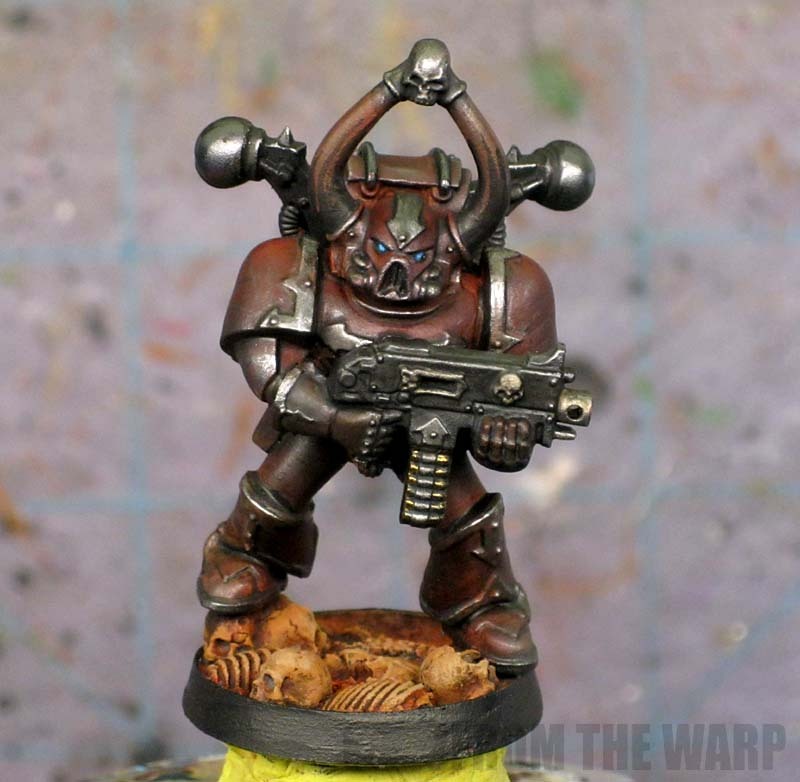 Yeah I found that too but the colour is just so awesome, especially for the grim dark look that I like to try and achieve. I've used it on my techmarines and servitors. I bet your Angels look really nice in scab red, I hate to see blood angels in a bright red scheme. You could pull this off with just about any color red you like I bet. There were lots in the spray paint aisle in the store. In the end, it comes down to personal taste and the shade/hue of red you're trying to achieve. Pretty cool model if you asked me. I think you achieved a good result when you factor in the time/effort it took you. This is great ... just as I was about to start a Word Bearers Army. Just a quick question. 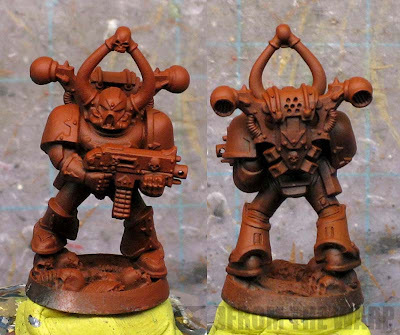 If I dont' have the Krylon primer, what GW paint would you recommned for the basecoat (assuming my minis have been undercoated Chaos Black)? I don't know, just needs to be more "red", but over all it's a really nice effect in the weathering. Like it overall. 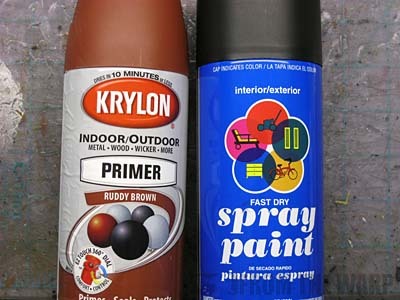 @ FourEyedMonster if you're from the UK, plasticote spraypaint is the same as krylon, just British. Vallejo's model air range works wonderfully for these techniques, as require no thinning and come in small bottles. Only caveat is you need an airbrush of course. 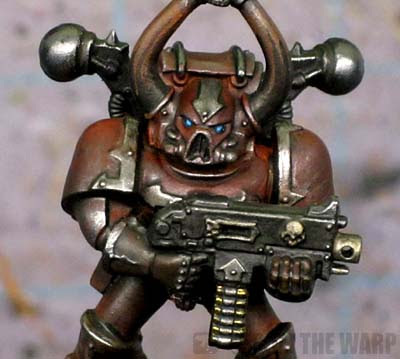 For my BA that have a similar tone to this Word Bearer I use Vallejo's German Red Brown as basecoat, followed by a zenithal application of Italian Red, which is similar to old Blood Red paint from Citadel. james: Glad you've been able to take it an apply it to your Tau. Snake88: Thanks, this is really quick job. It would take a little longer once you factor in any time you spend on your basing theme depending on how complex that is and painting/decaling the iconography. FourEyedMonster: You could use any color red you want. It all depends on what you want the end result to look like. I happened to have this red-brown color on hand and decided to try it. You could use any red really... do a test model or two and try some various shading and it would be easy to come up with a workable variation to this. BJC Mini Studio: I know what you mean. It works, but when it comes to the color red, it's all or nothing based on what particular shade folks prefer on their models. Albert: I'm missing the airbrush myself, but you're exactly right, the same thing can be done as this and with much more control as well. 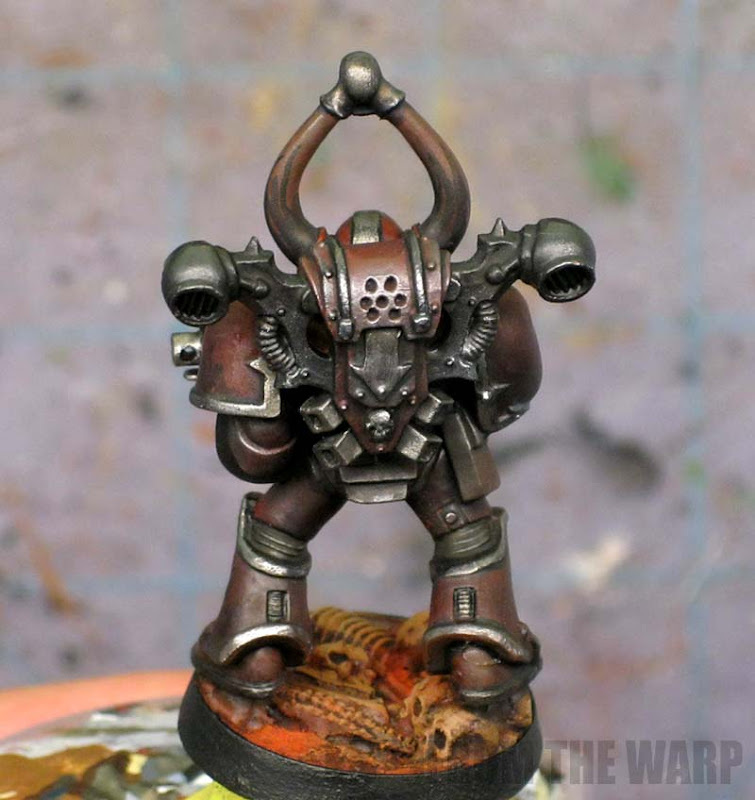 Do you use the spray paints you used on these models on any model for prime or base coats? Hive Angel: I'm not sure I understand... The black is what I prime with (that or white or grey) and I'll keep it as the basecoat as well if the model is wearing black armour. Saves me from having to paint it over again. Sometimes I will prime with other colors depending on what the predominant color is on my model. Like this case. I use the red for this guy, green for the Dark Angel and so on. I was referring to the brand of spray paint. You used the cheaper brand. Would you use that brand on any model, be it hobby or commission? If so this would save me a ton aginst GW's $16 cans. I have also found PPs cans are not all that good. Absolutely. Like pot paints, I have no loyalty to any one brand. I prefer the cheap stuff myself and would use this on any model I paint. For me, it comes down to the application of the paint and I have no problems with most brands (I can think of any I stay away from). The only thing that keeps me away from some brands is the crazy cost. Nice and very informative write-up! I was really looking forward to hearing about all the little details that led you to your results. And he's not to shabby for a mere 30 min paint-job, I like this sinsiter red-brown very much! Thank you very much for giving him a try! Kai: Glad it helped some. My painting has really transitioned over to using spray paint for my basecoat these days. Almost to the point where it's odd to think about basecoating with a brush. Hopefully this post gave you some ideas. Hm, I wonder if this was possible with black armour, too, I mean using a grey spray for highlights and then toning it down/tying it in with a black or dark brown wash... I know you've written something on that topic already and said that, oddly, it doesn't work with black, but seeing this model just gave me the confidence to try it nonetheless... Maybe it can be pulled of somehow, after all. You'd need to get a dark enough grey spray paint. I'm sure you could do it with an airbrush since you would have more colors to choose from. The only thing you have to keep in mind is that you are only adding highlights if you use black as your basecoat... there is no way to add "shadows" unless you start with a super dark grey instead of black. You may just have answered one of my prayers with this idea. It looks great and is a nice way for those of us who are still airbrush-less to use time saving zenital style painting techniques. Thank you. On the subject of the mini I think it looks great for the work put into it and if he was with a whole squad I think you'd have some very good looking table top mini's. pig of sparta: Thanks. It takes some practice, but I think it's a perfectly viable solution myself. I like the effect the more I play with and get better at it.